Lele Sadoughi is an American brand that creates jewelry inspired by the designer’s love of modern art, bold architecture, and a variety of colors. With Big Apple Buddy’s personal shopping service, you can now buy direct from the Lele Sadoughi online store anytime, anywhere. Lele Sadoughi’s classy and elegant jewelry pieces make for the perfect gifts or accessories for yourself! The Comb Tassel Necklace will surely help you make a serious fashion statement. With its 12k gold plated tassels and stick fringe linking them all together, this necklace will help bring some serious edge to any old plain outfit. If you like to make a statement with your jewelry, this necklace is the perfect choice! Here, you can also shop from a wide selection of bracelets, earrings, and rings. The Garden Fence Bracelet is a simple and easy-to-wear piece that will match any look. 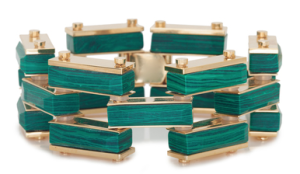 Made of hand-cut reconstituted stones of howlite and marble set in 14k gold plated brass sheets, this sleek, rich-green bracelet is easy to match and accessorize with other pieces of jewelry. Simple enough to wear every day, this bracelet will also stand out from all the other pieces of jewelry in your stash and help you make a special statement! It also makes for a great gift. All jewelry lovers know that you can never fully accessorize without earrings. The Abacus Chandelier Earrings are made of round smokey quartz glass and howlite reconstituted stones that are set to form a 2” length chandelier earring. 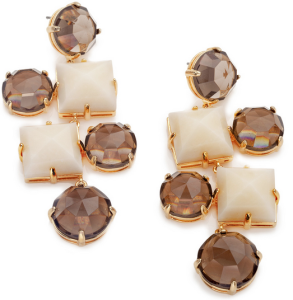 This pair of earrings is the perfect way to spice things up when you’re growing tired of your old studs. Instantly add some extra flair to your look when you put these on! Unfortunately, the USA Lele Sadoughi online store does not currently offer international shipping. However, Big Apple Buddy, your personal shopper, can help you buy products direct from the official USA Lele Sadoughi online store and ship them to your doorstep, no matter where you are in the world. If you would like to buy from the USA Lele Sadoughi online store, simply let us know which items you would like to order (by filling out the form below) and we’ll get back to you with a free international shipping quote within 24 hours!